RANGERS star Madjid Bougherra has revealed he loves life in Glasgow because of the tolerant attitude people have towards his religion. The devout Muslim opened his heart on how he was a victim of bigotry and racism when he started his playing career in France. Given the religious hatred that surrounds the Old Firm, most Scots will be stunned to hear our nation being praised for the way its people respect the faiths of others. But Ibrox ace Bougherra insists Scotland is a far better place for him to live compared with the country of his birth The 27-year-old Algerian international believes his Islamic beliefs held him back as he attempted to rise through the football ranks in France. And it was only when he came to these shores that he felt accepted and free from anti-Muslim attitudes. Bougherra said: "Leaving France has saved my career. You would have to be in my shoes to understand it. "If you had a name like Madjid, Mohamed or Mamadou you always had to work harder than others to gain respect. "Thankfully fate decreed that I'm now in a country where there is a different and more flexible mindset. "French clubs have idiotic reasons for not taking on Muslim kids but it is not a policy that pays. "Nowadays I play in the Champions League for Rangers and I'm off to the World Cup finals but I never got a chance at Dijon. "At my next club, Gueugnon, the coach, Victor Zvunka, tried to convince me not to fast for Ramadan. "He then said something so shocking to me I can't even bring myself to repeat it. "He lacked respect for my religion, even though the Muslims at the club were the best players. "One Friday we turned up to training with our prayer robes on, as we were going to go to the mosque afterwards, and he blew a fuse. "He told us never to come dressed that way again. It was as though we were dressed indecently and I will never forgive him. "I was also on the minimum wage there which was a pittance compared with what other players earned. "France is an increasingly difficult place to live in. People should be more open-minded, the way they are here. "I'm now living in a free country where everyone can wear what they like. "If a woman wants to wear a hijab or a burka it is her decision and nobody should have the right to say what she must do." Bougherra admits his poverty-stricken upbringing and the religious intolerance he encountered toughened him up and shaped his character. 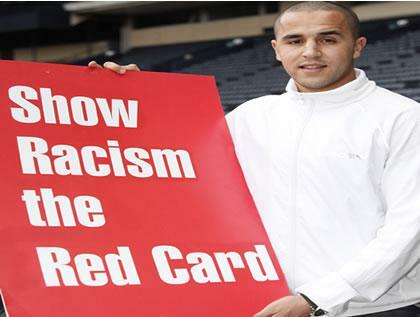 Bougherra said: "I spent my childhood in a council flat. Everyone knows what life is like on those estates. "We had to work twice as hard as the French people to get by. "My dad was a painter and decorator but he had health problems that prevented him from working and he ended up on the dole. "My mum was a housewife, who had lots of work in looking after five children. My dad did his best for us and he'd do bits of work here and there to pay the bills but life was hell for him. It is not easy to feed five kids when you are unemployed. "I joined my hometown club, Dijon, and my life was also tough there. "They had lots of good players who came from black or Arab immigrant families but the club did not believe in them. Kids from the estates had a bad reputation that clung to them. Clubs feared they'd create problems within the team." Bougherra revealed he was a good pupil at school and would have become a computer geek if he'd not taken up football. He said: "I studied computer science. "I was just a month away from the exam that would have given me a diploma in computer programming when I got an offer from Gueugnon. I should have passed the exam but my mind was so preoccupied with Gueugnon that I failed. I regret this as that diploma would have saved me had I not become a professional footballer. "I was a serious pupil at school and loved maths. Don't forget, it was the Arabs who invented numbers and algebra. "I was reasonably quiet as a kid but I did not back down when somebody wanted a fight. Where I grew up you needed to stand up for yourself.